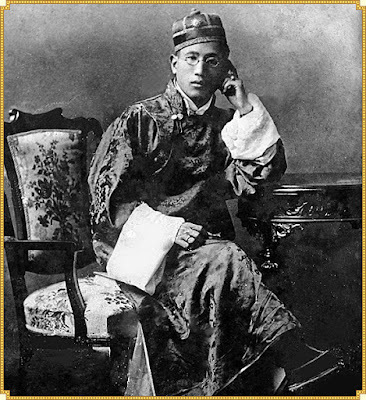 Sidkeong Tulku Namgyal the tenth consecrated ruler of Sikkim was born in 1879 and was the eldest son and heir of Maharaja Sri Panch Sir Thutob Namgyal. After attending traditional (monastic) schooling he was admitted to St. Paul's School, Darjeeling and at Pembroke College, Oxford. Sidkeong was admitted to Oxford in 1906 (the year that witnessed the commencement of a modern school at Gangtok) and during his two years’ stay in England he distinguished himself in the corporate life of the Oxford University. After accomplishing his education from Oxford he returned to his realm in 1908. After his return, Sidkeong was assigned the charge of Forest, Monasteries and Schools which were regarded as the three important departments. During the last phase of Maharaja Sri Panch Sir Thotub Namgyal, Sidkyong show evidence of his proficiency about the state administration. It can be said that the young lad had single handedly ran the administration of Sikkim in lieu of his father Sir Thotub Namgyal who was unable to execute the duty of a king due to poor eye sight. As an heir apparent, Sidkeong made two important covenants. One was the abolition of imprisonment as a penalty for defaults of debts and the other was the record in the Council Proceedings of the ban on settlements of plainsmen. After the death of Maharaja Sri Panch Sir Thotub Namgyal, Sidkeong succeeded him on 10th February 1914. His contact with the Western deliberation and conviction made him a secular and liberal in his deeds. Further, Sidkeong became the first bystander from Sikkim to perceive the rapid development in the west. Possibly, he might have also desired to have a similar arrangement in his Kingdom as well. It is reflected from the access of his sister Chuni Wangmo to a modern school. On the contrary of sending the Buddhist children to monastic educational institute Sidkeong sent his sister to attend modern educational institute that itself is possibly the best illustration about his liberalism. Being greatly engulfed in the Western ideas Sidkeong made an unsuccessful attempt to liquidate landlordism in Sikkim. This idea of the enlightened Maharaja has made him distinct from all his predecessors. In fact, it was the culmination of the western education that he received at Oxford. The lucid philosophy of Europe and America had now made Sidkeong a champion of the peasants back in his kingdom. He possibly had a superior dream to provide a better avenue of income to that brow beaten nucleus of production. But, the cogent idea of him created stern enemies among a large number of landlords. Further, his resilience of independence and forward personality strained relations with the British Political Officer Sir Charles Bell. Amid to all the qualities of an excellent ruler, the reign of Sidkeong Trulku Namgyal did not last long. In the winters of 1914, this young and open-minded Maharaja had an attack of Jaundice. A British Physician from Calcutta (now Kolkata) was called to the palace to take care of him. “While somewhat indisposed, a British Physician from Bengal administered a heavy transfusion of brandy and put him under a number of blankets; at the same time a fire was kept beneath the bed. Death came in the hour. Thus, ended prematurely a promising career in most suspicious circumstances” (Sikkim-A Concise Chronicle P 22) But, even in such a short period of ten months, Maharaja Sidkeyong Namgyal has tried to execute a commendable job for the betterment of his subjects. As any other charming characters of History he also had to battle with the adversaries which were prevalent within his administration. Thus, the most charismatic figure of the Sikkimese history had to meet an untimed bereavement at the young age of 35. A part from a good son and a great ruler, Sidkeong was a polyglot as well. He was well versed in many languages like Chinese, English, Hindi, Nepali, Lepcha and Tibetan. It is to be noted here that in 1903 Sidkeong led the Sikkimese representatives at the Delhi Durbar of Lord Curzon which eventually broke the political isolation of the Himalayan Kingdom. In 1911, Shree Panch Maharaj Kumar Sidkeong Trulku Namgyal was conferred the covetous Companion of the Order of the Indian Empire (CIE) by the British Indian Government. In 1913, he was granted the honorary title of Lieutenant. After his accession to the throne of Sikkim in 1914 he take pleasure in the title of Lieutenant His Highness Shree Panch Sidkeong Trulku Namgyal, Maharaja Chogyal of Sikkim, CIE.